A long-duration performance by Cristián Alvear of guitar exploration composed by Sarah Hennies specifically for him. Neither Hennies nor Alvear seem to be in much of a rush, I’m pleased to say; this work reveals itself with the kind of languidity usually seen in time-lapse film footage of flowers opening their petals on a pleasant morning on the Amazonian forest floor. Hennies observes and explores “even more deeply various percussive acoustic phenomenas, which are on this record, hidden inside of [the] classical guitar body”. Cristián Alvear is the right choice to carry her instructions out – he has got to be one of the most interesting guitarists around at present, certainly that I’m aware of. His technical mastery of the instrument, idiosyncratic playing style, openness and sheer raw interest in the sound-making possibilities of the guitar have made for quite a number of excellent releases in recent years. I’m trying to catch up with his prodigious output. Hennies’ score, although not reproduced within the packaging, apparently includes six sections of short instructions. Mappa do relinquish some examples on their Bandcamp page; here are a couple for illustrative purposes: “Play as accurately and consistently as possible but with the assumption that “mistakes” are inevitable” and “All sounds should ring freely (as long as is possible) unless otherwise indicated”. Things get off to a fairly leisurely start. Melody is alluded to with Alvear choosing two notes to activate over and over. Presently, there’s a dissonant chord which is given plenty of emphasis. Around the half hour mark, Alvear plays a crescendo, with increasing violence. This passage suggests to me what you might hear if you isolated Thurston Moore’s guitar without effects during a particularly brutal performance of ‘Expressway To Yr Skull’ or some-such Sonic Youth artefact from the late 1980s. The use of repetition circa 25 minutes forces the listener to consider harmonic relationship between two particular notes which, summed, cause a ghostly third tone to emerge. The last passage veers off into the barely-audible, with Alvear simply softly tapping the body of the instrument towards the end. The programme is repeated over on side B. Mappa describe the whole shebang as a “neverending cassette loop”. 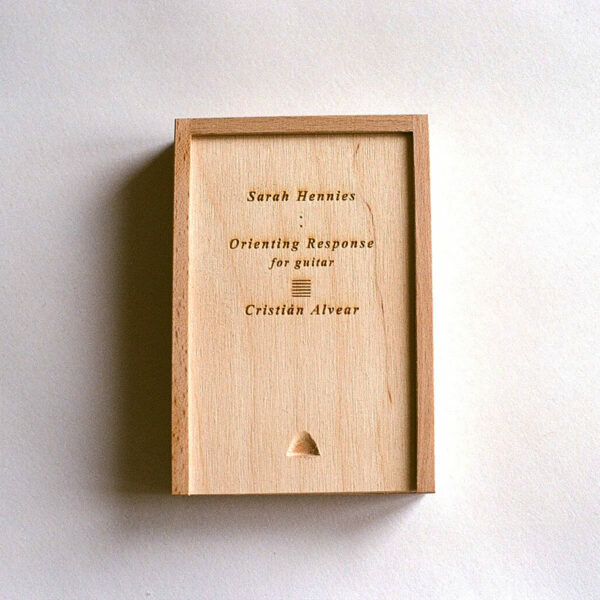 For those who are curious, there is an interesting recent podcast from Paul Margree of We Need No Swords blog featuring Cristián Alvear, where Alvear goes into a little detail about working with Sarah Hennies on Orientating Response for guitar. Margree’s comment “Cristián really is at the cutting edge of what’s happening in contemporary composition” says it all. Sarah Hennies is no slouch either; she has recently been developing a compositional role within a broader artistic practice. A particularly good piece is documented here. Orientating Response is an edition of 111 in a wooden box with sliding lid, the cassette itself caressed by a thin blanket of hessian. Beautifully done.